Sitting in the audience of a Theatre UCF performance of A Chorus Line, Amanda Stephen ’08 had an epiphany. “That’s what I’m supposed to be doing,” she thought. The next day, she added a theatre studies major to her interpersonal/organizational communication major. And push she did. Since graduating, Stephen landed the role of Alison Abdullah in season four of Orange Is the New Black, the Netflix original series that has won four Emmy Awards and been nominated for 17. 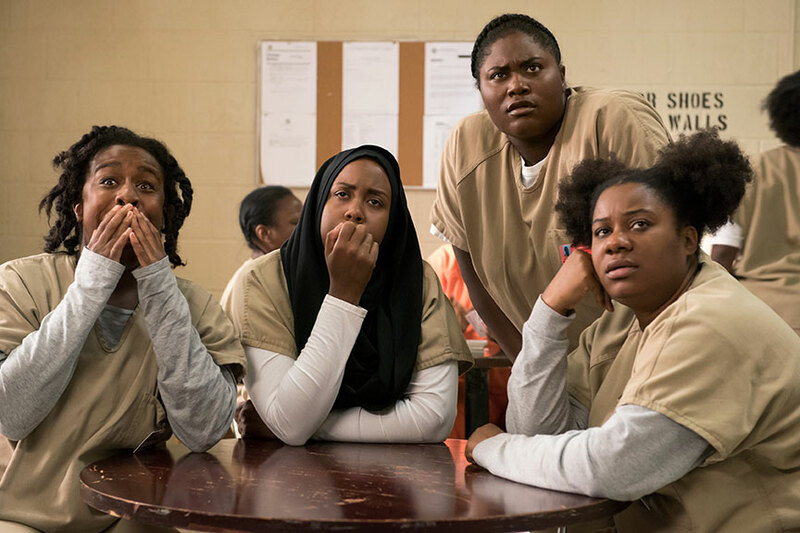 Amanda Stephen ’08 (second from left) as Alison Abdullah with Uzo Aduba as Crazy Eyes, Danielle Brooks as Taystee, and Adrienne C. Moore as Black Cindy in Orange Is the New Black. What’s your favorite thing about being an actress? I do a wicked Tina Turner impression during karaoke. When people don’t pick up their feet while they’re walking – that drives me nuts. I think I’d like being an artistic director for a theater. How do you feel your education has helped you in your career? The communication [major] has helped me navigate different personalities, different ways of thinking and different views. The arts side and acting prepared me with a lot of tough love. How did you get the role of Alison Abdullah? My manager called me on a Friday and told me I had an audition on Monday, which was a blessing because you usually don’t get a weekend to prep for an audition like that. … I formed Alison — who she is and how she fit into the world in Orange. Monday, I went into the offices and auditioned. I heard back on Friday from my manager that I got the role. I started to scream and jump around the house and gashed my bum on the side of a table. What was your favorite scene to film this season? My favorite scene has to be when Crazy Eyes, Black Cindy and I are trying to get a picture of Judy King [a Martha Stewart-like character] coming out of the shower. We block her exit without her knowing, and Black Cindy’s trying to get a picture with her. Who’s your favorite character on the show and why? Oh, I love them all. I can’t. I will say I’m a big Red fan. Kate Mulgrew is great. … I was a big [Star Trek:] Voyager fan, so I can’t help myself. This year’s Oscars received a lot of criticism for not including African American actors and directors. How do you feel the industry has treated you so far in your career? I’m fortunate to have a manager who has the same views as I do, where we go after roles that I feel I can play, not just because it says late 20s, African American girl, medium to large build. We look at a character and see the details in the character that she feels that I can pull out. … It takes open minds on the casting end, on the producing end, and on the actor’s end to look beyond that. Thankfully we have a lot of people in the industry now who are more open to that. It’s still a struggle, don’t get me wrong. But I look toward what’s possible and what I can do on my end rather than submitting to what the industry standards are. I’d love to play Titania from A Midsummer Night’s Dream. When I get older, I would love to play Ma Rainey from August Wilson’s Ma Rainey’s Black Bottom. But I think a role that I feel so connected to, that I feel like I was made to play, I don’t know if it’s been written yet. If someone were to make a TV show or movie about your life, what would the title be? I’m originally from Montreal and have dual citizenship. 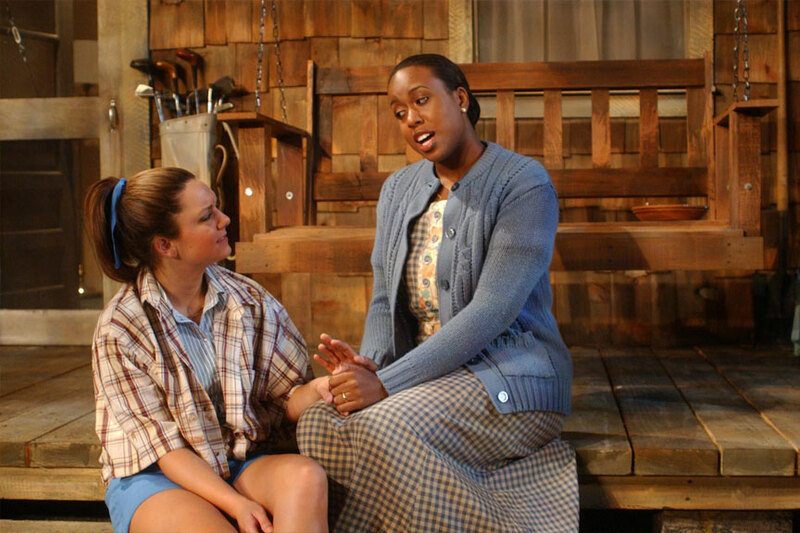 Amanda Stephen ’08 (right) as Clemma in a 2005 Theatre UCF production of Neil Simon’s Proposals. Portraits by Geoff Levy ’11.